The concept of Green Lanterns being space cops is nothing new, after all Geoff John’s coined that phrase over fourteen years ago but I feel like Morrison taking that idea to it’s fullest intention. In the past other writers would float that idea of the Green Lantern Corps as space cops but most of the time, the corps ends up becoming more militaristic due to the story that was being told. The dialog feels like I’m watching a weird police procedural, and it’s not just the Corps even the spider villain in custody shares similar dialog. This is the best way for Morrison to keep the story in a relatively grounded but still keep intact the absurd vibe perfectly intact. It’s really the only way that scene with Hal Jordan talking to a Green Lantern who’s a erupting volcano has any sense of normality because of how the dialog is constructed. It’s only been two issues and while it’s way to early to be permanent, I’m not the biggest fan of how Grant is handling Hal’s voice. Hal’s bravado remains intact, but that’s where any semblance of the Hal that most readers are familiar with end. While Hal’s arrogance might be his defining trait. there’s a level of charisma that comes along with that. Again this is only issue two but I feel that Morrison wants to bring back the boring Hal Jordan. It make sense when you understand what Morrison wants to do with The Green Lantern Corps but I sincerely hope that the fun Hal comes out eventually. Even though Hal isn’t fun, I’m glad Morrison hasn’t forgotten humor with Evil Star explaining why he shouldn’t be harassed just because he gets his name from the device he uses to commit evil. I believe in Morrison but Hal can’t be boring if he expects readers to go along with his insane concepts. Liam Sharp is a beast, there is no simpler way to put it. The first image that I need to bring attention is his single page splash of Oa and I’ve never seen Oa depicted in this manner. This single page gives me Jack Kirby vibes without directly copying the King himself. The sheer detail is mind blowing it actually makes Oa feel alive and a place the Corps would have as their base of operations. Plus I love that Olaff didn’t have every building decked out in green. I understand that this the GLC but the color scheme in this page makes it feel more realistic despite it being a alien world. Let’s not forget Sharp’s amazing storytelling, the interrogation scene. you can feel tension coming off the page and even though this spider creature has no human resemblance to connect with the audience on a base level, somehow you understand the spider’s emotional state. Plus I hope Liam enjoys drawing nightmare fuel because this comic was full of it, it’s refreshing to see a sci-fi not have this perfect visual of space. 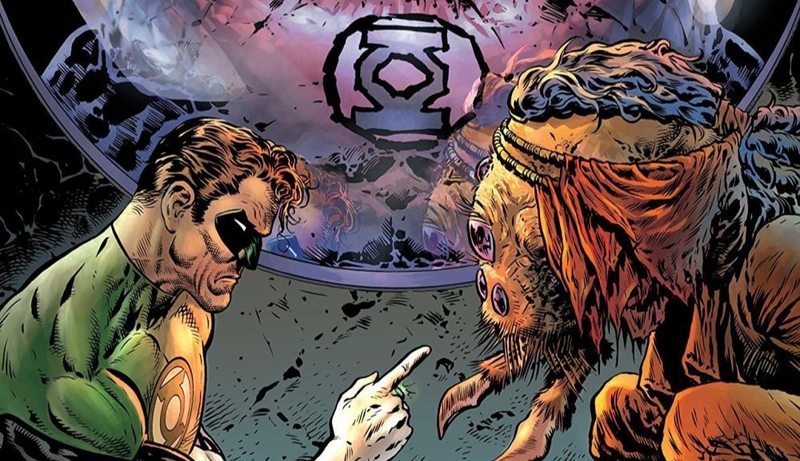 Morrison wants to bring the weird to Green Lantern and Liam Sharp seems more than happy to oblige. Pure nightmare fuel in some page. I’ve been reading green lantern since the 70s and had a full run of the silver age title for a while; space cop was a term WAY before Johns, the first one to use it that I remember was Wein, but Englehart used it too. Of course it was inherent in the idea from the Showcase issues by Broome, where Abin sur called him a “space patrolman”. I like johns but he gets way too much credit – it’s like Texas Hold Em taking over the idea of Poker. Anyway great issue, and Morrison is on his way to reclaiming Hal Jordan as a great character. Too many human, American GLs out there in a space sector the size of several galaxies. Best to pare them down, and johns didn’t help there either.